Anne is portrayed in the book as being ruthless and manipulative, someone who will stop at nothing to achieve what she wants, including taking Henry VIII away for her sister (and his wife!). She isn’t written in a sympathetic light and many of the negative stereotypes about her are used, such implying that there is something unnatural about her relationship with her brother George. Research has discredited a lot of these claims and many people, myself included, believe Anne to have been a passionate and intelligent lady who was desperate to cling on to the position she had risen to and whose downfall was a result of the political power games and religious upheavals happening at the time rather than her own wrongdoing. That said, she is still a very interesting character in the book and it definitely makes you want to find out more about the real Anne Boleyn. The main criticism aimed at The Other Boleyn Girl is about how historical accurate it is. It’s true that the author has used poetic licence with her story and picked on the theories that are most interesting rather than ones backed up with the most evidence. Indeed many of these theories can be found in Reetha Warnickes book, The Rise and Fall of Anne Boleyn, which paints a less sympathetic picture of her than Eric Ives brilliant book The Life and Death of Anne Boleyn. As an example, it’s widely believed by historians such as Ives, that Anne was the younger of the sisters and that Mary spent time in France, possibly even having an affair with King Francois I. All this speculative and will probably remain that way because the truth is there isn’t a great deal of primary historical evidence on Mary, just as there isn’t about Anne especially prior to her courtship with the King. Unfortunately what written evidence we do have on Anne has been written by people who had a very negative bias against her, such as the Spanish Amassador Chaupeys, a supporter of Catherine of Aragon. 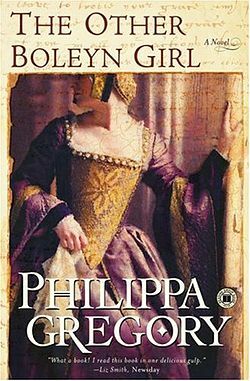 Philippa Gregory’s book is labelled as fiction and her purpose is therefore to entertain us so I think we can forgive her for taking some historical liberties and including the most explosive theories, as this makes for the best story. I would just urge everyone not to believe the really negative view of Anne Boleyn and save your judgement of her until you’ve read a true, factual historical biography of her. If you take this book for what it is, a historical romance with elements of Tudor history then its a really enjoyable read. The authors descriptions of life in court are vivid and descriptive and really bring the period to life. You really feel for the women of the time who lacked any real power and were at the mercy of all the men in their life, be it fathers, uncles or husbands and ultimately, like everyone else, the King himself. The only real weapon they had at their disposal was their sexuality but they also needed to keep their wits about them if they were going to survive life in the dangerous Tudor court. Sadly Anne is unable to control the forces around her or the people who mastermind her eventual downfall. Despite how Anne comes across in the book I did still feel extremley sorry for her and I found the end, despite knowing what was going to happen, really sad, even though there is a definite underlying tone in the book that she was guilty at least in part for what she was accused of. This is something I strongly disagree with, but as I said previously, this books interpretation of Anne isn’t to be taken as fact! The other theme in the book that definitely resonated with me was that of the role of Tudor women and how their usefulness was judged by what successful marriage could be arranged for them. The Boleyn girls are pawns (as all girls were at that time) in their family’s game of court politics, helping them to gain power and favour. This left me feeling nothing but sympathy for them, and fortunate that I live in the modern world! The Other Boleyn Girl is a great Tudor adventure story, the plots and sub plots are woven together beautifully and the characters are well written so you really care what happens to them, even if you don’t like them very much. It’s a must read for any fans of the Tudors or anyone who likes historical novels, I for one couldn’t put it down! I’m sure, like me, The Other Boleyn Girl will make people want to research both of these fascinating Boleyn girls in more detail, what was the real reason for Anne’s downfall, was George really guilty of the charges and what role did his wife Jane really have in the story, what was the relationship like between the sisters and did Anne ever really love Henry VIII? There are so many questions that this book leaves you wondering about so some further reading is suggested below.